← What are the impacts of carbon pricing in California? We are excited to feature the following post from the blog team at SolarReviews.com. Read more of its insightful articles at http://www.solarreviews.com/blog. Colorado’s pine and spruce forests are being devastated by beetles that bore under their bark, reproducing and spreading tree-killing fungi. As the world gets warmer the problem gets worse. Spurred by warmer temperatures and longer growing seasons, mountain pine beetles are now reproducing twice annually, compounding the problem. These assaults are leaving wide swaths of tree carcasses throughout the evergreen stands that are among the magnificent hallmarks of the Rockies, offering ready fuel for wildfires —or perhaps electricity. That’s the aim of a new pilot project announced by Xcel Energy in Colorado. The world can’t go solar and use renewable energy fast enough to reduce the pollution creating climate change, alone, so it needs more solutions like using biomass in a clean-burning system. Operating as Public Service Co. of Colorado, The utility, the largest in the state, filed with the Colorado Public Utilities Commission (CPUC) on May 20 to pilot a biogas generation project that uses beetle-kill trees as fuel. “Some of these affected areas are close to Xcel Energy’s service territory in Colorado, and could have future impact on company infrastructure and service reliability, which makes the project of interest to the company,” the company says. The demonstration project could help thin beetle kill in such devastated regions, while producing clean, renewable energy for Xcel’s customers. At this point, which technology used to create the biogas has not been established. However, creating biogas from waste material like woody biomass often requires torrefaction or pyrolysis. Both processes use heat to convert the biomass to a gas that can be used by a generator. The way the woody biomass is converted to biogas can produce additional benefits, like process heat and a carbon sink, locking carbon in a nutrient-rich soil amendment called biochar. Such systems, like the one being developed by Biochar Solutions of Colorado, are still in pilot stages. But they could be a potential replacement for conventional biomass generation power plants.tion creating climate change, alone, so it needs more solutions like using biomass in a clean-burning system. Operating as Public Service Co. of Colorado, the utility, the largest in the state, filed with the Colorado Public Utilities Commission (CPUC) on May 20 to pilot a biogas generation project that uses beetle-kill trees as fuel. “Some of these affected areas are close to Xcel Energy’s service territory in Colorado, and could have future impact on company infrastructure and service reliability, which makes the project of interest to the company,” the company says. The demonstration project could help thin beetle kill in such devastated regions, while producing clean, renewable energy for Xcel’s customers. Xcel Energy has been investigating small, forest biomass project opportunities since 2007. 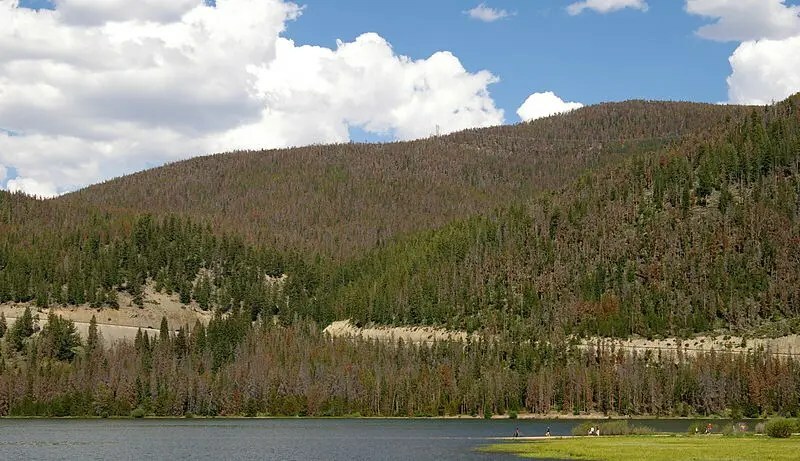 “Because the overall health of Colorado forests has degraded due to drought and infestation, there has been increasing interest among various stakeholders to pursue this type of demonstration project,” explains Xcel’s Colorado CEO David Eves. “The Forest Service supports the use of biomass for energy,” says Daniel Jirón, regional forester for the Rocky Mountain Region of the U.S. Forest Service. “Expanding this opportunity carries out our priority to accelerate the pace of forest restoration, to contribute to job creation, and to create healthier and more resilient forests for the future. Reducing the risk of wildfire protects vital infrastructure on the landscape,” he explains. This entry was posted in Electricity, Renewables and tagged biogas, Electricity generation, Electricity Training, Energy Education, Renewable Energy. Bookmark the permalink.